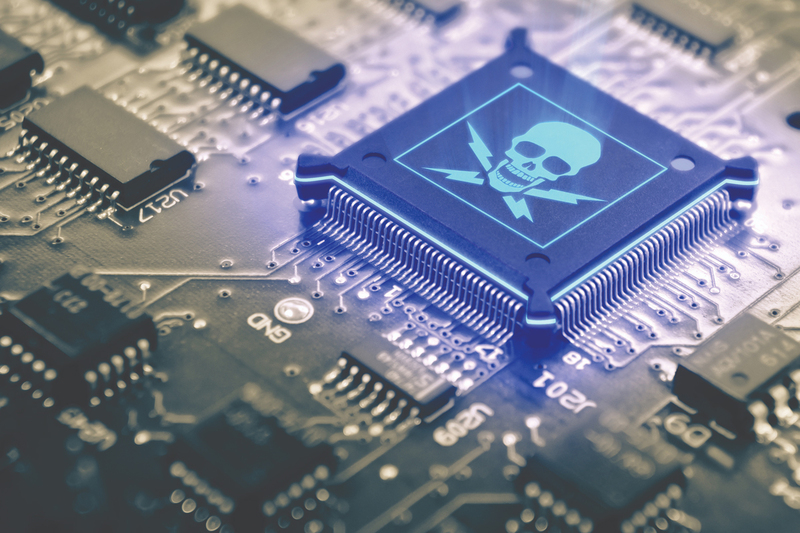 Incidents of counterfeit electronic components dropped dramatically in 2017, according to ERAI Inc., a global organization that monitors, investigates, and reports issues affecting the supply chain. ERAI reported a total of 771 suspect counterfeit and nonconforming parts in 2017, which shows a marked decline from prior years. The organization is cautious, however, about drawing too many conclusions from the data. 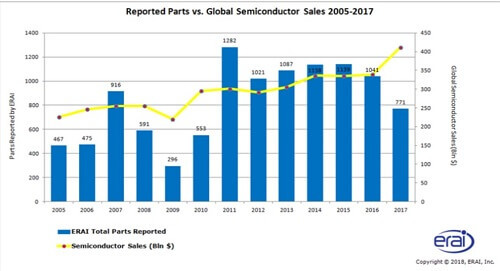 Global semiconductor sales have increased, ERAI notes, and factors associated with the decline in suspect parts could reflect the robust anti-counterfeiting efforts adopted by procurement organizations; counterfeit parts prevented from entering the U.S. through customs seizures and detentions; or the lack of enforcement of government and industry reporting requirements. “It will be interesting to see if this trend persists through 2018 or whether the decline was only temporary,” Akhoundov said. Historically, incidents of counterfeits increase during times of component shortages. When the authorized supply chain reports long lead times and allocation, manufacturers turn to independent distributors that buy and sell devices on the open market. Independent distributors also have a unique perspective on parts that are in short supply. “We are still seeing strong demand with passives leading the pack,” said John McKay, president of sales for independent distributor Freedom Sales. “The demand is from all regions. Asia specifically has increased demand and is more willing to design in alternates to second source the AVL. We are seeing longer lead times and decommits from our supply chain,” added McKay. Many independents have taken significant steps to reverse the impression they are vulnerable to counterfeits. Others, however, still actively push counterfeits into the supply chain. For example, Orange County distributor PRB Logics Corp. has been charged by the U.S. Department of Justice (DOJ) for sale of counterfeit ICs that could have been used in military applications. The indictment alleges PRB principal Rogelio Vasquez acquired old, used and/or discarded integrated circuits from Chinese suppliers that had been repainted and remarked with counterfeit logos. The devices were further remarked with altered date codes, lot codes or countries of origin to deceive customers and end users into thinking the integrated circuits were new, according to the indictment. Vasquez then sold the counterfeit electronics as new parts made by manufacturers such as Xilinx, Analog Devices and Intel. Military equipment is a significant target for counterfeiters because components are costly and military-spec components are increasingly rare. Military equipment – along with devices used in marine, medical and aerospace applications – outlasts many of the components used in their design. These industries frequently turn to commercial off-the-shelf parts that become obsolete relatively quickly. Lansdale Semiconductor is one of several distributors that specializes in mil-spec aftermarket parts. These businesses are a key line of defense against counterfeits. Lansdale and similar companies buy inventory of end-of-life components as well as their masks and die. Original component manufacturers (OCMs) authorize these distributors to re-manufacture their products. Dale Lillard, president of Lansdale, notes that measures such as the National Defense Authorization Act continue to push military OEMs and subcontractors to procure from OCMs, franchised distributors, and the authorized supply chain. Despite many improvements, the electronic supply chain is far from perfect and many companies continue to rely on reputable independent distributors.